New York Gov. Andrew Cuomo stepped up his opposition to teachers unions and support for charter schools during his State of the State address Wednesday. He put forward tougher teachers evaluations, easier ways to fire teachers, and raising the cap on charter schools. How can that be, Cuomo asked, that just one third of New York students pass the new, tougher state tests, but 98 percent of teachers are rated effective? “Today, Gov. 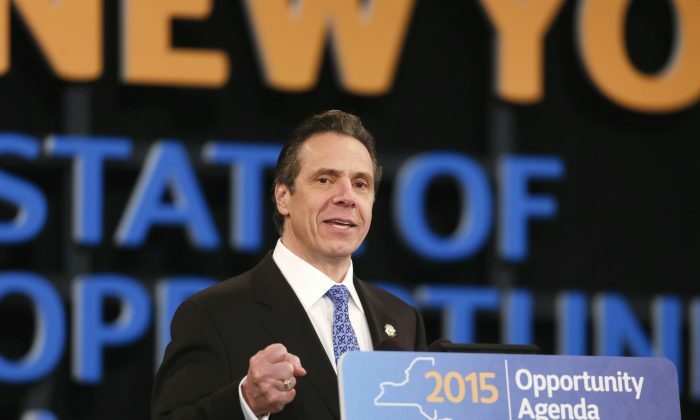 Cuomo proposed a bold plan for an urgent education crisis, in a courageous first step in the fight to ending the state’s failing schools crisis,” stated Jeremiah Kittredge, Chief Executive Officer of the Families for Excellent Schools, in a release. The non-profit advocates for firing teachers and closing schools with low standardized test scores and is connected to charter school supporters. “We thank the Governor for taking this important first step toward improving education across the state,” said Kyle Rosenkrans, Chief Executive Officer of the Northeast Charter Schools Network in a statement. Rosenkrans commended the governor for proposing to raise the charter cap from 460 to 560 schools as well as slightly increasing funding for some charter schools, as such schools are run privately, but get public funding and charge no tuition. The teachers union felt quite the opposite. “The Governor’s speech was warmed-up Bloomberg leftovers,” stated Michael Mulgrew, president of the United Federation of Teachers, referring to cold-to-unions ex-Mayor Michael Bloomberg. Mulgrew accused Cuomo of ignoring the real problem and blaming teachers for all problems with education. Unions usually blame poor school results on poverty, as low academic achievement usually goes hand-in-hand with low-income student populations. “I’m inviting the Governor to drop the rhetoric of his hedge-fund pals who hate public education and come visit a real New York City public school, where teachers, kids, and parents are working to make education a success,” said Mulgrew, head of the 200,000-member New York City teachers union. Indeed, quite a few hedge-funders support charter schools and blame failing public schools on union protections shielding mediocre teachers. Charter school supporters gave at least $1.6 million to Cuomo’s re-election campaign. The teachers unions, some of the biggest campaign spenders in the state, cut their contributions to Cuomo for his re-election and endorsed his opponents after the Governor diverged from their agenda. Cuomo proposes increasing a test score component of teachers evaluations from 40 to 50 percent. The rest would be based on classroom observations. But if teachers fail the test scores part, measured by how much their students’ scores improved, they would automatically fail the whole evaluation. Two failures in a row and a teacher can be fired. If a teacher gets the highest rating, Cuomo promises $20,000 bonus. Also, teacher tenure, lending additional job protections, would be granted only after five consecutive years of positive evaluations. Now teachers gain tenure automatically after three to four years. Additionally, if a school has low scores for three years, Cuomo wants an overhaul–handing the school administration over to a non-profit specialized in school turn-arounds, adding more services, like tutoring and after-school, and giving children in such schools priority in charter schools’ admission lotteries. Cuomo may get his way in the Republican-controlled senate, but may have a hard time in the Assembly, where Democrats rule and teachers unions wield significant influence. The state teachers union, New York State United Teachers, didn’t respond to requests for a comment.